I love my horses I really do. And because I love them, I take care of them when they do things like get hurt or sick or colic. But seriously, why must they do these things? Wouldn’t they rather spend my money or better things like tack or grain or treats or paper chases? Or spend my time going on trail rides or exploring? No, of course not. Which brings us to this morning. We went out at 630 like we do every morning to feed. Erik divided, I bucket prepped. Except when I placed Batts’s bucket in front of him, he stretched, he pawed, he bit Jiminy, he stuck his face inside, but he didn’t eat. 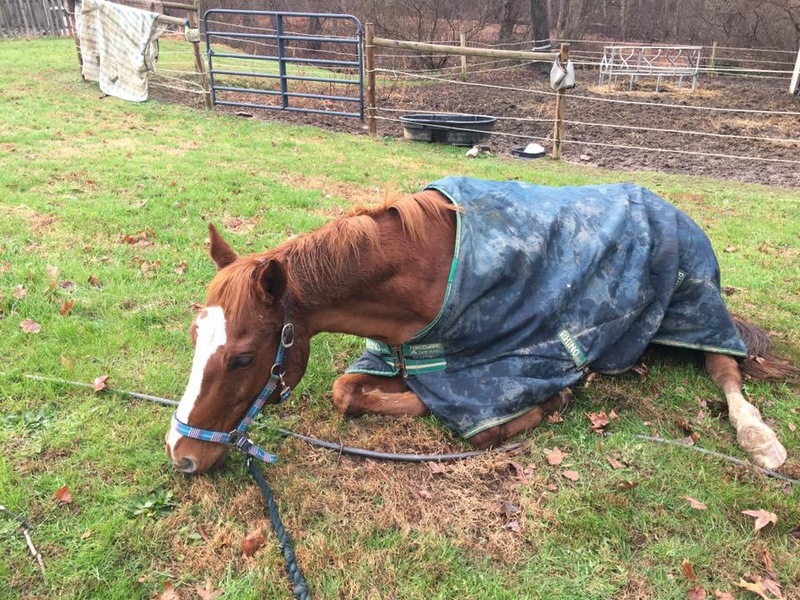 The dreaded, frickin’ colic. So we grabbed the banamine, squirted it down his ungrateful throat, and removed breakfast. A little later, I came back out, armed with a halter, clothing other than my pajamas, my cell phone, and took him for a walk. He had moderate grass interest, but all did some rolling and pawing. Around 830 I decided to call the vet but thanks a staff meeting it was still the after hours service so I decided to call after 9. In the meantime we practiced trailer loaded, POOPED(!!!!! 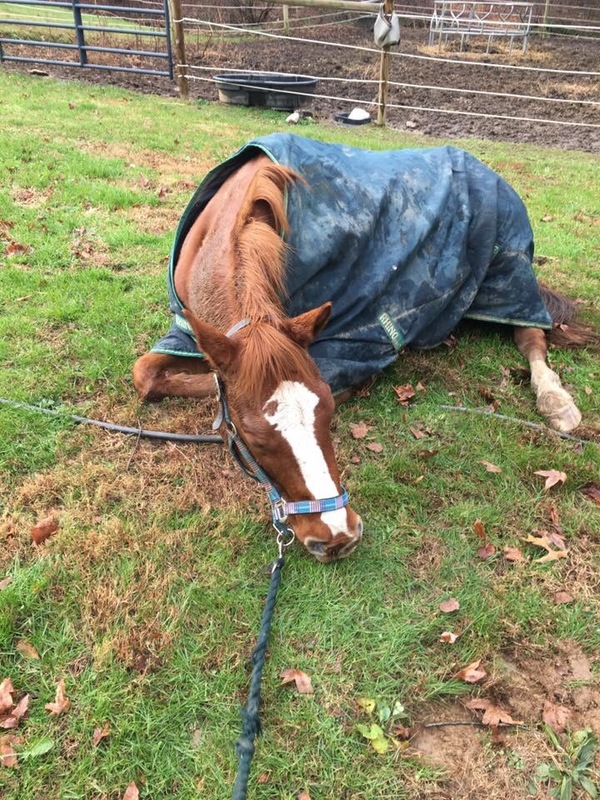 ), felt better, ran around the round pen like an idiot, felt worse, called the vet, layed down and grazed until the vet came. Vet on call came armed with Batty’s colic history and decided drugs and a rectal were in order first. Of course, more poop first (!!!). As expected, small impactionwas felt, but it was doughy and she though it would resolve itself. So we tubed with lots of fluids and hopefully that’ll be it. Ughhhhh cmon Batty!!! 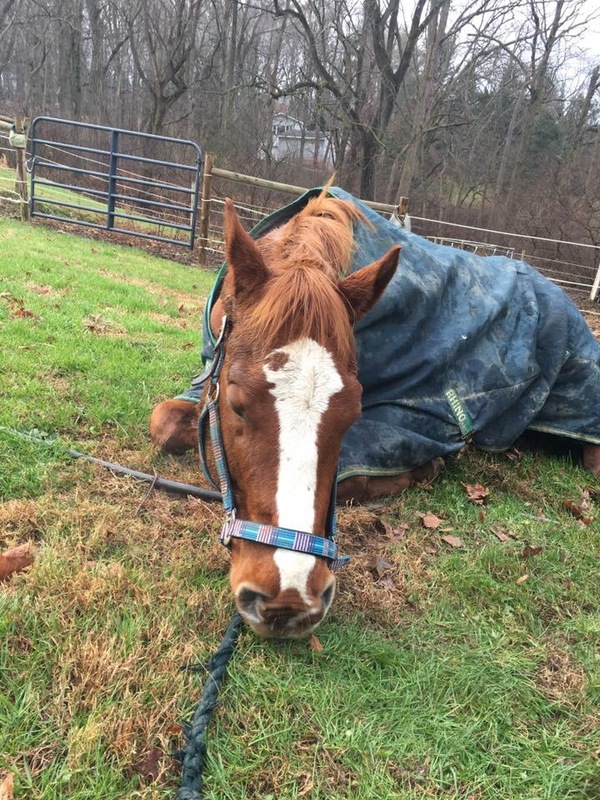 Colic is the worst – scary and frustrating and all bad things all wrapped into one. My fingers are crossed that he pulls thru no problem! Thank you! He needs to stop with these stupid impaction colics! As the vet said, I’m doing all the preventative stuff already. Stupid horse! He seems to be feeling better but being cautious still today. Poor boy; he looks so miserable. I hope he gets better soon. Holy cow i hope he is back to normal by this time but scary!! He does look miserable in the shots. this weather has been the worse with the up and down temps. Yikes! Yes, much better but he’s certainly has mastered miserable! Hoping he’s back to normal, colic is so scary!